My thoughts: Definitely my favorite of the recent Pantone “colors of the year.” CBS Sunday Morning today they went through some of the other colors from recent years, and I forgot just how much I disliked the colors for 2016. Let’s just put those choices down to overall bad decisions for 2016 and forget they ever happened. Okay? Now I just need to figure out how to talk my wife into integrating this into our home color scheme. Maybe a nice throw pillow. 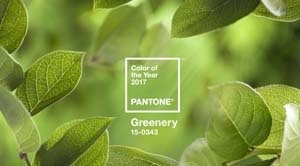 With a nod towards nature, Pantone has named Greenery as its color of the year for 2017, which elicits the restorative lushness of the great outdoors.